The official indoor volleyball court size in American measuring units is 29'6" which is 29 feet and six inches for the half court area. The full volleyball court area is 60 feet x 30 feet. If you were using the metric system then the half court area is 9 meters by9 meters while the entire court is 18 meters long by 9 meters wide. 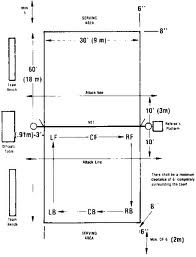 Many people like to round these numbers up to 30 feet by 60 feet but the accurate measurements are the ones I stated and are indicated in the diagram above. 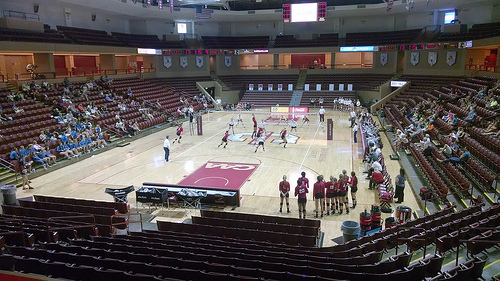 The above measurements are the same for both the men's and women's volleyball court size. If you were to play on a girl's court and then go play on a guy's court, although the net is higher on the guy's court, the volleyball court size, which means the length and width of the court, would be the same. Once you know the dimensions of the court you should learn of some of the other interesting characteristics concerning the volleyball court size which is defined by the court lines and are usually painted in contrasting colors on the competition floor. 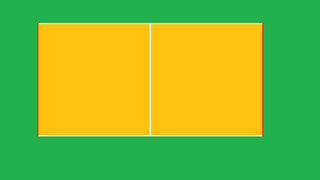 The lines that border the court edges which serve to define the court size are two inches wide. To accurately measure the boundary lines you start measuring from inside of the court lines. You'd take your tape measure or ruler and place it on the part of the line closest to the court playing area to measure two inches wide for an accurate reading. Remember two inches is equal to five centimeters. 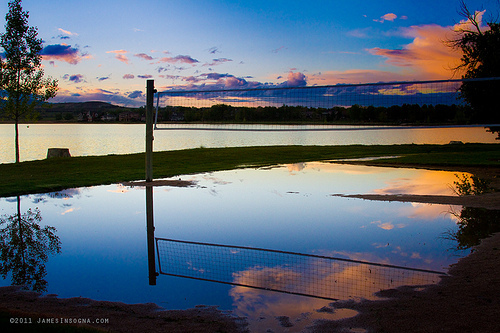 The volleyball court size is defined by four boundary lines, the two longest ones are called "sidelines." These run lengthwise or along the long side of the court and they are both perpendicular to the net. 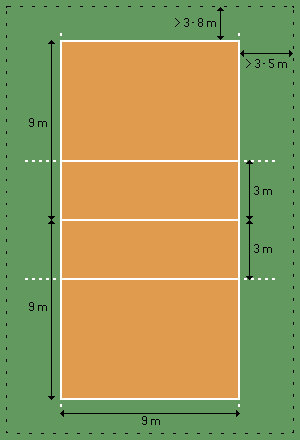 Volleyball court sidelines should be two inches wide and are highlighted in the diagram below by the red parallel lines running along the longer sides of the rectangle. The other two lines on the opposite ends are end lines. The endlines connect to the sidelines on the shorter sides of the rectangle. The endlines are parallel to the net and to the ten foot lines. The ten foot lines on each court half, separate the front court from the back court. Court end lines are two inches wide and are highlighted in the diagram below by the red parallel lines on the shorter sides of the rectangle. The area surrounding the outside of the court is called the free zone. It has a minimum width of six feet six inches or two meters. This is the area located between the court and the team bench, and surrounds the entire court area where players safely enter to play a ball back into the court without interference. The center line which runs underneath the net is another boundary line which separates the two half courts from each other. For years in outdoor competition on the sand, the beach volleyball court size was the same as the indoor court which was 30 feet by 60 feet. In 2001, in a controversial move the FIVB voted to minimize the volleyball court size for outdoor doubles sand competition to a much shorter size of 8 meters by 16 meters for men and women. A year later, the AVP, the Association of Volleyball Professionals did the same thing. The rationale behind the move was to make the beach game more interesting, faster and competitive for television audiences. 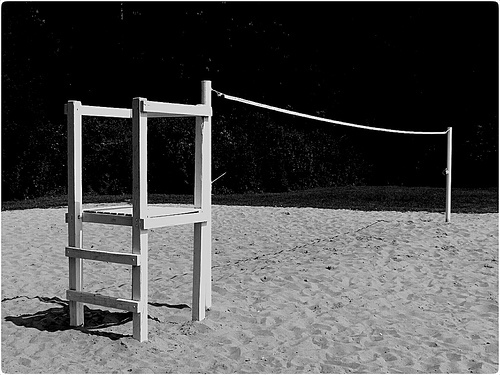 For the same reasons the libero volleyball position was introduced in indoor volleyball, the outdoor volleyball court was made smaller because television audiences around the world had proven to be more attracted to the defensive game and not just the power game that was a trademark of the men's way of playing. As far as sand depth is concerned, the sand in the court has to be 12 inches deep. In sitting volleyball, the official court size is 10 meters by 6 meters. The court size for the nine man game is 33 feet long and 33 feet wide. The net is taller at 7 feet and 8.5 inches high. You should become familiar with the court and all of its components for example, the antennas, the front court, back court, official court size, the net, court lines and you should know the correct net height. The court size from one end to the other is basically 60 feet by 30 feet, give or take a few inches. I think, specifically its 59 feet and a few inches by 29 feet and a few inches, but you can check out this volleyball court diagram. There's a centerline that measures two inches wide and goes from sideline to sideline which divides the two playing courts into two 29 foot 6 inch halves where the teams play, one on one side and the opposing team on the other.